When getting rid of termites, it is best to eliminate them at the source to avoid future damages. Termites feed on dead wood, especially the tips of fence posts inserted in the ground. While they may live in your fences silently weakening them for years, they pose a larger problem. There is never just one termite, but often a colony that searches for food to eat within a hundred meter radius. This means that any wood structures near your fence could potentially be at risk. This includes your home, and wood hardscaping features, and your trees. Here is how you can get rid of termites. While removing your old infested fence and burning it will appear to take care of the problem, it only really addresses the surface. 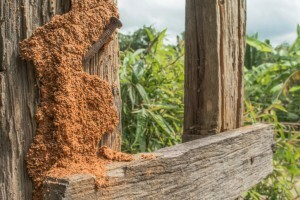 Unless you attack the termite colony at its source, you can destroy and rebuild the same fence over and over and have the same termite problems. In order to make sure your house is safe, make sure that no infected parts of your fence touch the ground or parts of your home directly. Bait traps are the most environmentally friendly way of exterminating termites. If you are dealing with termites near edible plants, you may want to opt for this in order to not expose them to poisonous chemicals. Bait traps are installed in the ground with 1 trap for every 3 meters around a fence perimeter. They should be placed 30 centimeters away from the structure. There are different kinds of baits too. There are both contact poison baits and growth hormone baits, to name some kinds. However, these often work slowly, as termites can bypass them entirely. The most effective way to protect your property from termites is with a chemical barrier. This is done with a liquid soil treatment that can be either repellent or non-repellent. Repellents can keep new termites out, but doesn’t do much to stop the colony already thriving there. Non-repellents, on the other hand, are slow acting poisons that kill termites and has a transfer effect which can slowly kill the entire colony. Ready to get rid of termites in your fences?